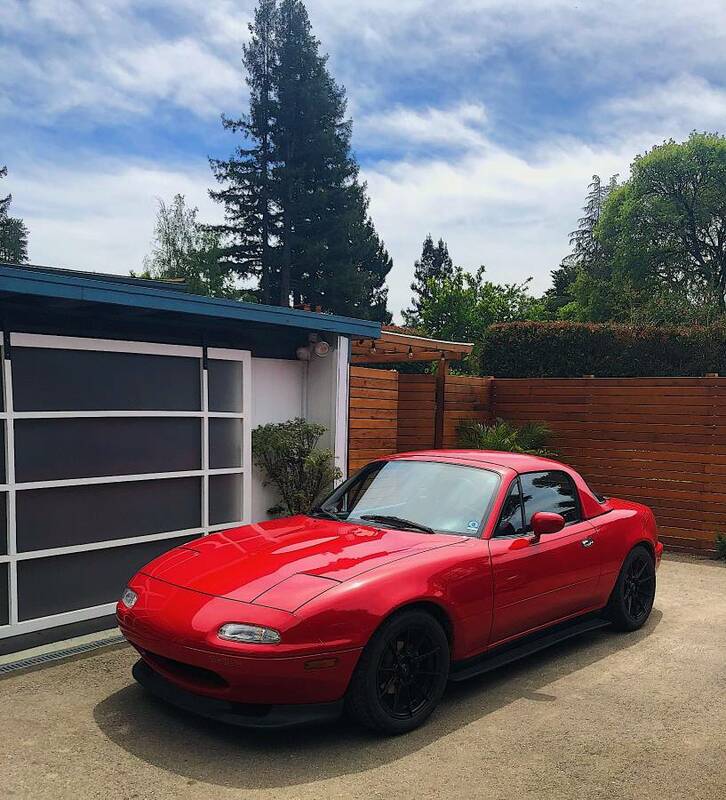 Back in 2015 we featured a 6k mile first generation MX-5 that was picked up by Jesse at Barnfinds.com and then sold for about the cost of 10 typical 200k MX-5s and at the time I wrote "Whoever buys this car will have a very nice example of one of the best selling roadsters of all time...but he will be faced with the same conundrum as the current seller -- how do you enjoy a car without racking up the miles? Likely, this story will be continued." The car was subsequently sold by the then owner because..well..you know. A few months later in July 2016 the car showed back up on craigslist (now with 8k miles) with the then current owner trying to milk $11k from the little red cash cow. 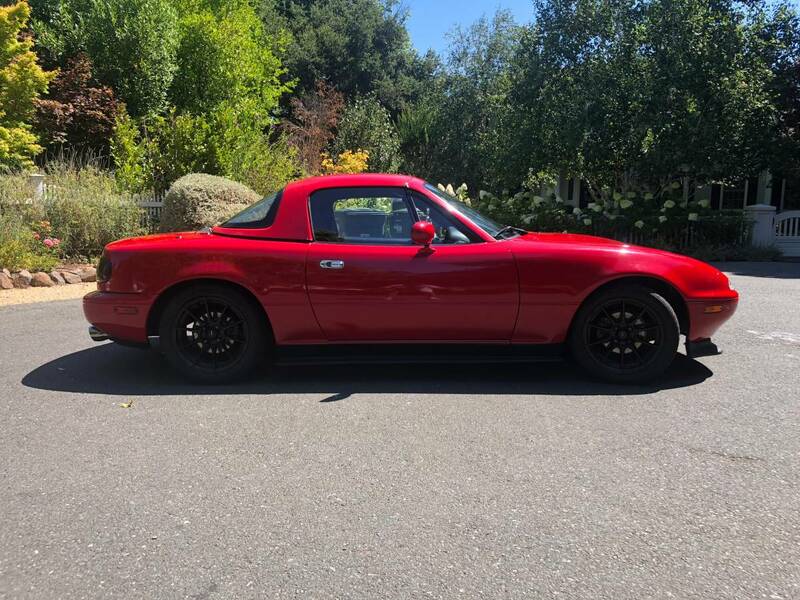 Two years later and this car is back on the market, now with several modifications, 11,500 miles and offered for $11,500 -- find this 1990 Mazda MX-5 Miata offered for sale in Menlo Park, CA via craigslist. Tip from Matthew. 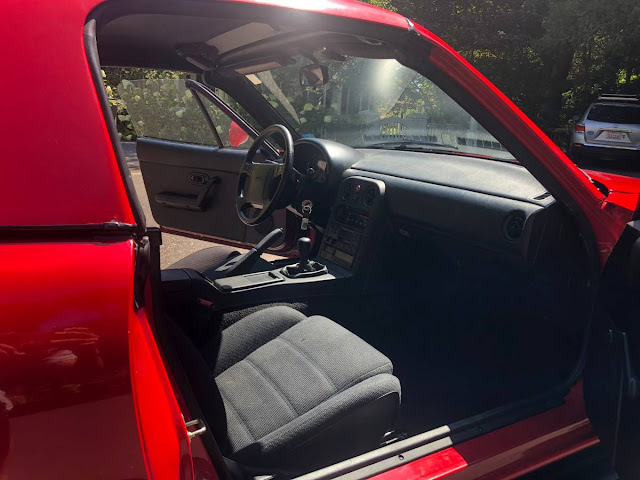 At first glance, I didn't think this was the same car as the previous listings -- but DT tipper and amateur sleuth Matthew pointed out that not only did the car share a no-AC spec, but also had similar underhood surface oxidation, and rear bumper scratch. A check of the VIN JM1NA3517L0112790 confirms that this is the same car. Okay...now stay with me as I am going to step on my soapbox again for a moment. What is the problem with collecting cars like collecting stamps? Nothing. Provided that your collection is properly respected by expert and public alike. If you've got a rare Napoleon era stamp in mint condition or a Ferrari 308, random people will smile, nod, and understand that the stamp/car is rad/cool/collectible. However, what if your stamp was the first ever printed Forever Stamp released in 2010? If you show it to people and explain that you paid $0.41 for it and that it is MINT condition and maybe worth $0.50 today ...people yawn and look for the nearest exit. If you show this 11k mile MX-5 to your mother-in-law she is going to say "wow...that is nice...what did you pay for it? 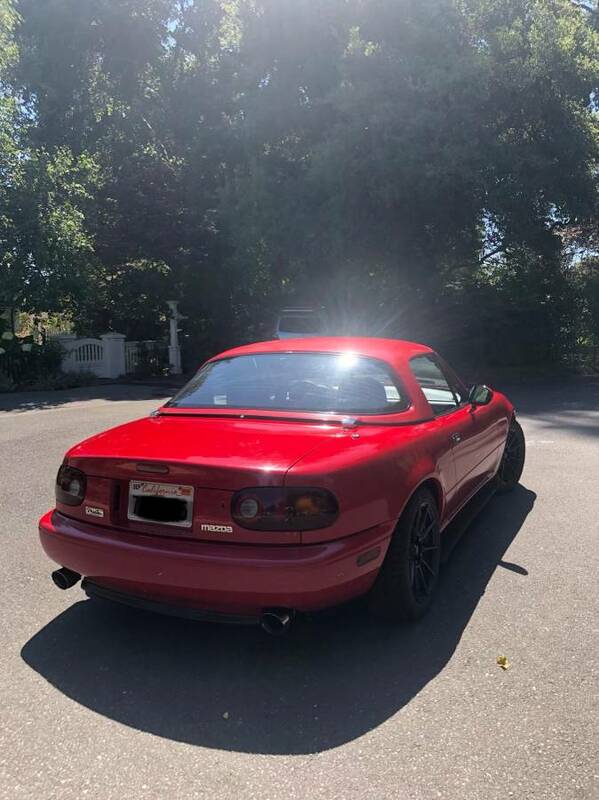 Oh, that seems like a lot of money for a 28 year old car...can't you get a 10 year old MX-5 for the same price?" Yikes, the old lady has a point...what was I thinking? And then the double edged sword of owning a low mile car that wants to be driven comes crashing down on your spinal column obliterating the disc between the C1 and C2. The reason you bought this car is because it is the best example of the cheap fun car to drive from the 1990s, but...BUT if you put 10k miles on it each of the next 3 years, it suddenly becomes yet another $4k MX-5 -- you should have gotten one with 100k miles on the clock. Hopefully the tasteless mods can be removed. Good luck with that price with them on the car. To me they knock 5k off the ask. I have a special tool to remove those Tree�� insmellorator things ( except for the black ice ones - need a hazmat suit for them) if you buy this you could flip it for big bucks. Let me know if you want to borrow it. Jesse and Josh, such clean cut young men! 0.8 liters per exhaust tip, free flow Yo! P.S when ever I do two post in a row I feel like K2. Can I be the new K2? Probably not. My tastes are not eclectic enough. Is K2 in witness protection? IRA safe house? Gitmo? I especially enjoy our new collegian’s perspective on “tasteful mods”... I really don’t understand kids these days. K2 was separated from his parents at the border and has not been heard from since. Slightly imperfect cars with some mileage on them on the sweet spot of the value curve are the best to buy. As long as there is evidence of maintenance and care, I purchase and drive guilt free.